The Sigray AttoMap™ is a powerful x-ray analytical microscope with the highest resolution and highest sensitivity laboratory micro x-ray fluorescence (microXRF) capabilities available. The system provides both transmission-based x-ray structural analysis and fluorescence chemical mapping with <1-10 ppm trace element sensitivity acquired within 1 second, comparable to 3rd generation bending magnet synchrotron microprobes. Examples of the AttoMap's capabilities. More can be found in our gallery. HOW DOES THE ATTOMAP™ ACHIEVE ITS SUPERIOR PERFORMANCE? The AttoMap™ employs the patent-pending Sigray FAAST™ (Fine Array Anode Source Technology) x-ray source that enables over 50X higher brightness than microfocus x-ray sources employed by conventional microXRF systems. The target of FAAST™ is comprised of a fine array of metal microstructures embedded within a diamond substrate that, upon electron bombardment, produces high intensity x-rays. In comparison, conventional microfocus x-ray sources use an extended uniform metal target. The design of the FAAST™ source allows: 1) rapid thermal dissipation through the diamond substrate to quickly cool the microstructures and 2) linear accumulation of x-rays produced by the individual microstructures. Due to the excellent thermal conductivity of diamond, use of novel anode materials (e.g. Pt, Cr) are now possible. Access to these new characteristic x-ray spectra is a crucial advantage of the x-ray source, as it allows for optimization of detection sensitivity to various elements of interest. A dual energy approach, in which two target materials can be used interchangeably, provides the flexibility and performance required when multiple applications are required and/or multiple elements of interest are to be detected. Advantage of a Dual Energy target: Shown are fluorescence cross-sections of various elements (listed in rows) as a function of the excitation energy of different targets. Using two or more target materials allows increased sensitivity to a wider range of elements. 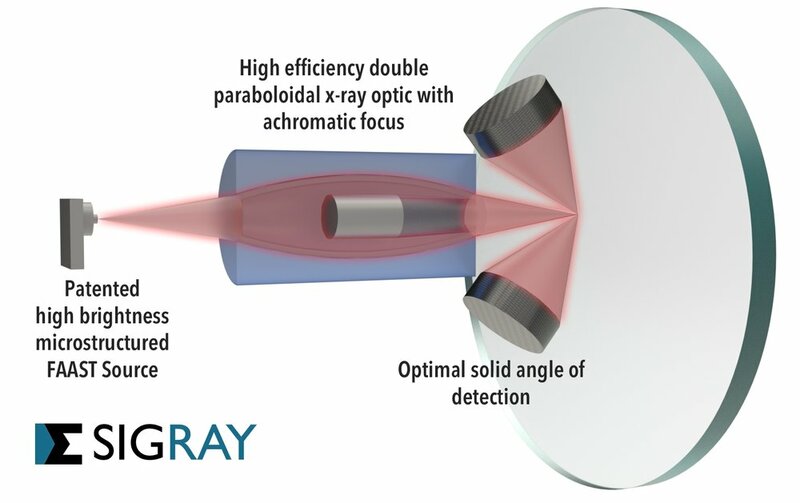 Sigray has developed a high efficiency, microns-scale resolution double paraboloidal x-ray condenser optic developed through a sophisticated, proprietary manufacturing process. An overview of the comparative advantages of the optic vs. a polycapillary can be found here, and additional information can be requested below. 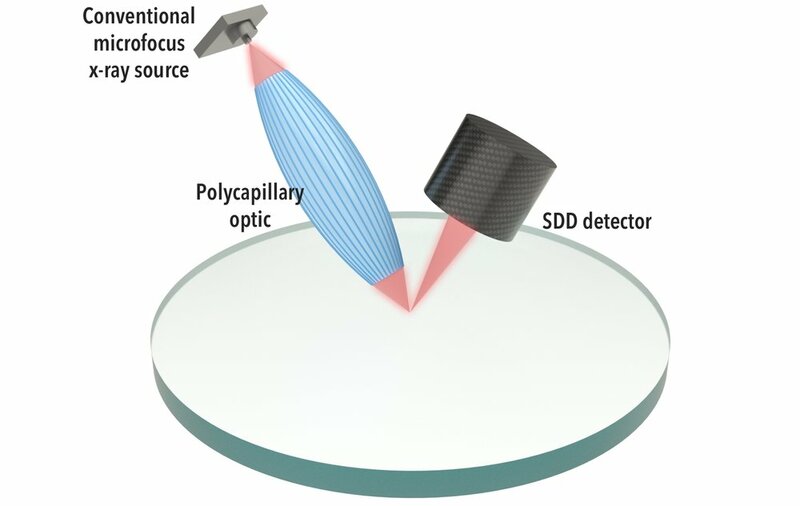 The long working distance and the compact form factor of the double paraboloidal mirror lens enable multiple SDD detectors to be placed close to the object to collect 10X more fluorescence x-rays than detectors used in conventional microXRF setups. Detectors in conventional microXRF systems are typically placed at an offset angle to the spot, as the halo artifact of polycapillary x-ray optics necessitates the use of an aperture. The Sigray mirror lens does not produce the halo effect. The large solid angle of collection together with the high brightness x-ray source and efficient mirror lens enables the Sigray Attomap to provide high speed analysis. Additionally, a detector placed to detect transmitted x-rays allows simultaneous microXRF and high resolution transmission-based 2D imaging, enabling the system to truly act as an x-ray analytical microscope. Interested in how the Sigray AttoMap™ will help your particular application?